Antarctica is a continent devoted to science. At 14 million square kilometers (5.4 million square miles), it's larger than the continental United States, but smaller than the North American continent. It is home to 44 science stations from 18 countries around the world. While a few of these countries have made territorial claims to parts of the continent, the Antarctic Treatythe document that governs Antarcticaneither recognizes nor disputes these claims. In short, Antarctica is owned by no one. McMurdo Station, constructed on the bare volcanic rock of Ross Island, will be the base of operations for our traveling team. The station was established in 1956 as a military settlement. When the Antarctic Treaty outlawed military activity on the continent, McMurdo, one of three U.S. stations in Antarctica, became an icy outpost for some of the most ambitious science on the planet. Roughly 1,000 people spend the summer in MacTown, as it's called. About 250 of them remain at the station year-round, through the dark Antarctic winter. McMurdo is a gateway through which many scientists and visitors arrive in Antarctica. With over 100 structures, including a radio station, harbor, airport, and even a few bars and restaurants, McMurdo has a life and culture of its own. Our interactive map will show you where our teamMary, Noel, Julie, and Paulwill be traveling. An aerial photograph of McMurdo Station will show you a surprisingly well-developed Antarctic city. The Real No-Man's Land - The story of how Antarctica's unique politics affect its just-as-unique science. Ice Gallery - Antarctica's variety of ice formations give it a beauty unrivaled anywhere on Earth. Tour our ice gallery to see more (requires Flash 5 player). Lessons on Sea Ice - Mary tells us what she's learned about living on the ice. Antarctic senses - Paul writes about the sights, sounds, smells, feel and taste of the continent. Penguin Ranch - Mary tells why she loves the creatures otherwise known as "charismatic megafauna." Finally, Some Real Antarctic Weather - How they celebrate a snowstorm at McMurdo. Follow the tour with our interactive map. 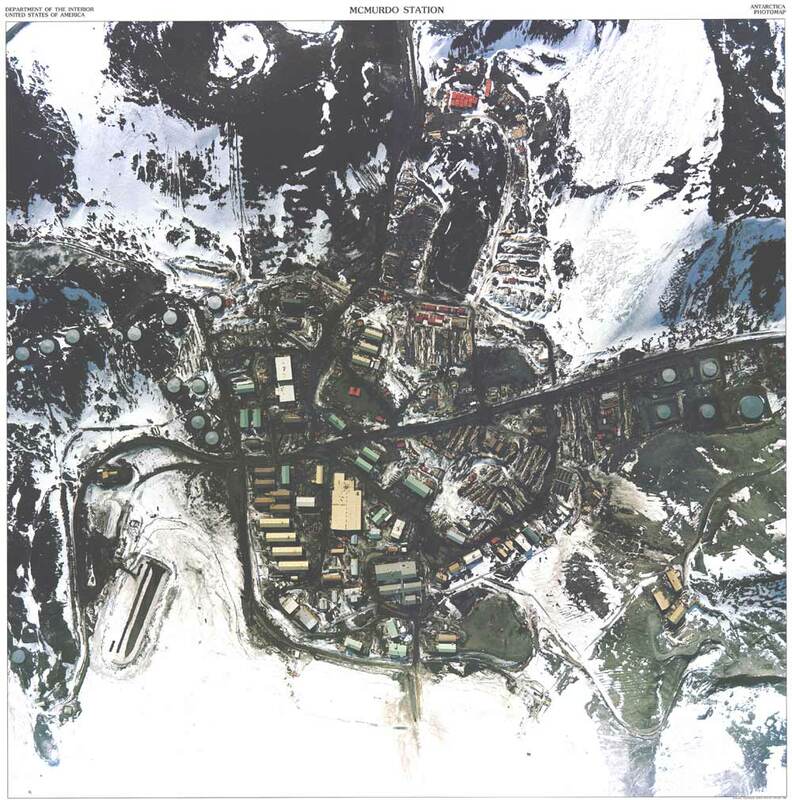 Aerial photo of McMurdo Station. The continent's international mix raises unique political questions. Tour the icebergs in our ice gallery.